Vice President Joe Biden’s recent visit to Israel, where he expressed the United States’ commitment to its security, was tarnished by the Israeli Interior Ministry’s announcement that it would build 1,600 new settler homes in occupied East Jerusalem (perhaps a not-so-subtle message to the White House, located 1600 Pennsylvania Avenue?). It was a slap in the face to Biden who was urging Palestinians to engage in peace negotiations with the Israelis. But the announcement is one of a list of “facts on the ground” created by Israel that cast shadows over its commitment to a viable two-state solution. Those in the White House today, and those who wish to be in it tomorrow, should take the time to reconsider their “special relationship” with Israel. Canada would benefit from doing the same. Last month, the Harper government preposterously suggested that an attack on Israel would be considered an attack on Canada. Israeli Prime Minister Benjamin Netanyahu recently added two shrines in the West Bank to a list of Israeli heritage sites, and the Israeli mayor of Jerusalem, Nir Barkat, unveiled his plan to turn Palestinian districts of the city into Jewish heritage parks. The plan will obviously require more evictions and more Palestinian homes to be demolished, something Israel has rarely balked at. All this is music to the ears of the nearly 500,000 Jewish settlers in the West Bank and East Jerusalem. While Biden was being slighted in Israel, the U.S. State Department released its annual “Country Reports on Human Rights Practices,” which it presents to the U.S. Congress. 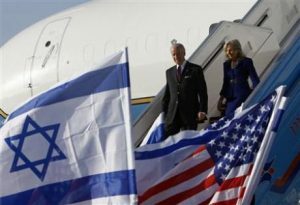 Though its report on Israel and the occupied territories is generally fair and well worth the read, the State Department parrots the unsubstantiated accusations made by Israel’s apologists against the Goldstone Report, a U.N. investigation which found both Israel and Palestinian militants guilty of war crimes during the Gaza war over a year ago. In terms of human rights, Israel’s year could hardly have been worse. On top of its usual settlement expansions, use of torture, arbitrary arrests, extrajudicial assassinations and other discriminatory policies, practices and restrictions, Israel managed to kill more than a thousand Palestinians in the Gaza Strip and collectively punished its entire population with a blockade. Thirteen Israelis were killed during that war, of which four were killed by friendly fire. In fact, Israel’s war was planned while Hamas was abiding by the ceasefire, as reported in the Israeli newspaper Haaretz, and it coincided with the U.S. elections and President Obama’s inauguration. Rocket fire was reduced by 97 percent during the ceasefire, and the rockets fired were from groups other than Hamas, often in response to Israeli actions in the West Bank. Israel, which failed to lift the blockade and broke the ceasefire on Nov. 4, 2008, killing 6 Palestinians. Hamas resumed firing rockets afterward. But the State Department seems to have forgotten these facts. Israel’s relationship with America is special indeed. Beyond the influences of the Israel lobby in Washington, the relationship is hinged on the fact that nuclear-armed Israel is the region’s only superpower—the United States can leverage its influence over Israel in its dealings with the Arab states. So the United States has spent billions to shore up its client state in the Middle East. But with an ultra right-wing government in Israel, and America’s own reputation in tatters over Iraq and Afghanistan, Israel may be mostly undermining America’s credibility. Its pit bull in the region may become too hard to handle. The 2009 Israeli elections resulted in the formation of not only a right-wing government but the most overtly hawkish in Israel’s history. The ruling coalition includes the religious Shas party, whose head is Interior Minister Eli Yishai, and the ultra right-wing Yisrael Beiteinu, whose head is Foreign Minister Avigdor Lieberman, an immigrant of the former Soviet Union and a settler. In this political climate it should come as no surprise that President Obama is not well liked in Israel. The rise of right-wing ethnic nationalism in an already militaristic Israeli society makes it difficult for the United States to pretend both countries share common values and outlooks. Israel’s youth is becoming as radicalized as its politicians. A recent poll of Israeli high school students showed that nearly half do not believe Israeli Arabs should have the same rights as Jews, and that more than half would deny Arabs the right to be elected to Israel’s legislature. This radicalization is surprising considering most Israeli youth have not experienced the same level of violence and injustice as their Palestinian counterparts, yet a 2008 U.N. study revealed only 8 percent of Palestinian young adults believe violence will help solve the conflict. In its report, the U.S. State Department did recognize the “institutional, legal, and societal discrimination” that Arab citizens and Palestinians face in Israel, and the situation seems to only be getting worse. America’s special relationship with Israel will become harder to justify in the future if it turns out the “only democracy in the Middle East” is, in fact, Lebanon. Israel may be the region’s superpower but unconditional support will only encourage bad behavior, which will harm America’s, as well as Canada’s, interests in the region. Politicians would be wise to reconsider their unqualified backing of Israel before the pit bull learns it can bite the hand that feeds it. Barnabe Geisweiller comes from a Political Science background and holds a Master’s in Journalism from Columbia University. He has resided and worked around the world, and currently works with gold exploration companies based out of Vancouver.